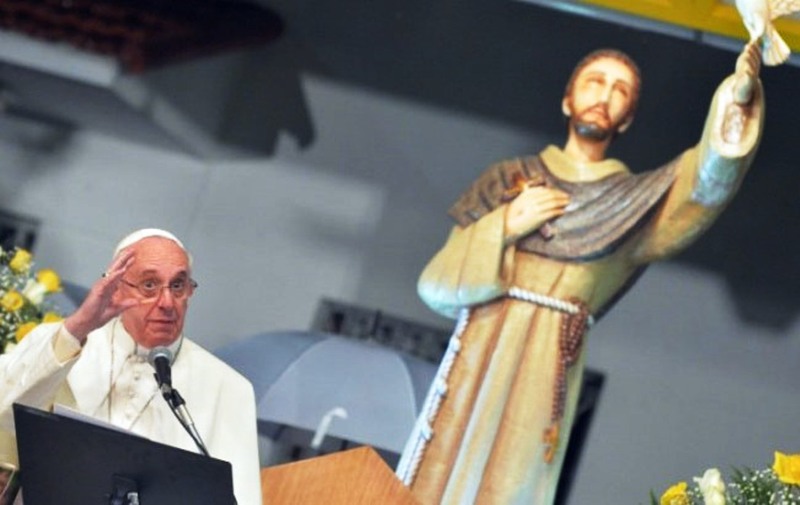 Pope Francis in front of a statue of his namesake, St. Francis of Assisi. What exactly was “historic” about this meeting? And how does it relate to Pope Francis’ efforts “to advance interreligious dialogue and mutual understanding?” Exploring these questions offers useful lessons, including on past and present approaches to Islam. Before proceeding, it should be understood that Pope Francis often portrays himself as walking in the footsteps of his chosen namesake, Francis of Assisi—“the man of poverty, the man of peace, the man who loves and protects creation,” as Jorge Mario Bergoglio explained in 2013 when he became pope as to why he had adopted the name of Francis. As for what the pope is characterizing as a “historic meeting between Saint Francis of Assisi and Sultan al-Malik al-Kāmil,” here is the story: After centuries of Islamic invasions that saw the conquest of at least two-thirds of Christian territory—as documented in my recent Sword and Scimitar: Fourteen Centuries of War between Islam and the West—Europeans finally began to push back via the Crusades in the late eleventh century. What was the purpose of St. Francis’ dangerous mission? Was he, as Pope Francis regularly implies, trying “to advance interreligious dialogue and mutual understanding?” Yes and no. He certainly relied on the word, not the sword. But the word he offered was as sharp as any sword. As Rega writes, “Fully aware of the dangers, Francis was determined to go on a mission to the unbelievers of the Muslim nations. The primary sources are in agreement that he was now ready to sacrifice his life and die for Christ, so there can be little doubt that the intent of his journey was to preach the Gospel even at the risk of martyrdom” (emphasis added). Francis then explained: “That is why it is just that Christians invade the land you inhabit, for you blaspheme the name of Christ and alienate everyone you can from His worship.” This is a reference to Islam’s dhimmi rules, which, along with debilitating Christian worship, make Christian lives so burdensome and degrading that untold millions have converted to Islam over the centuries to ease their sufferings. What evil they do and how far from a true appreciation of the Man of Assisi [St. Francis] are they who, in order to bolster up their fantastic and erroneous ideas about him, image such an incredible thing … that he was the precursor and prophet of that false liberty which began to manifest itself at the beginning of modern times and which has caused so many disturbances both in the Church and in civil society! And these are precisely the differences between St. Francis and Pope Francis: while both are willing to dialogue peacefully with Muslims, the medieval saint was not willing to compromise Christian truths or ignore Islam’s violent reality, whereas the postmodern pope is. I don’t like to speak of Islamic violence, because every day, when I browse the newspapers, I see violence, here in Italy… this one who has murdered his girlfriend, another who has murdered the mother-in-law… and these are baptized Catholics! There are violent Catholics! If I speak of Islamic violence, I must speak of Catholic violence . . . and no, not all Muslims are violent, not all Catholics are violent. It is like a fruit salad; there’s everything. The pope failed to mention or understand that violence committed in accordance with a religion and violence committed in contradiction of a religion are radically different. Yes, people of all religions commit violence. But the Catholics that Francis cited did not murder their girlfriends and mother-in-laws because of any Christian teaching; on the contrary, Christian teachings of mercy and forgiveness are meant to counter such impulses. Conversely, much of the violence and intolerance being committed by Muslims around the world is often a byproduct of Islamic teachings (for example, persecuting and executing “apostates,” that is, born Muslims who wish to leave Islam or embrace another religion). True, but that which is “fundamental” to every religion differs. While Muslim and Christian fundamentalists adhere to a literalist/strict reading of their scriptures, left unmentioned by Francis is what do the Bible and Koran actually teach? The Christian fundamentalist may find himself compelled to pray for his persecutors, while the Muslim fundamentalist may find himself attacking, subjugating, plundering, enslaving, and slaughtering non-Muslim infidels. In both cases, the scriptures—Bible and Koran—say so. In short, when it comes to confronting Islam with honesty and sincerity, and standing up for the faith, Pope Francis woefully fails to live up to the brave friar whose name he appropriated.